Health gums are important to your overall oral health. Often referred to as gingivitis, if this generative disease is left untreated it will cause significant tooth and gum deterioration. We understand the word gingivitis can strike panic in a patient’s mind. The reality is that the treatment is a simple deep cleaning performed right in our office. Scaling and root planning can be used both as a preventative measure and as a stand-alone treatment for a periodontitis sufferer. The objective of scaling & root planing is to remove etiologic agents which cause inflammation of the gingival (gum) tissue and surrounding bone. Common etiologic agents removed by this conventional periodontal therapy include dental plaque and tartar (calculus). This is a non-surgical procedure which completely cleanses the periodontium, works very effectively for individuals suffering from gingivitis (mild gum inflammation) and moderate/severe periodontal disease. It provides for healthy gums, strengthening your oral health. 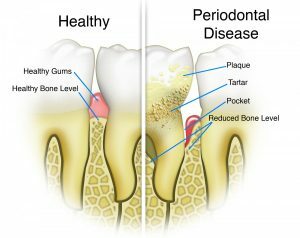 Disease prevention – The oral bacteria causing periodontal infections can travel via the bloodstream to other parts of the body. Research has shown that lung infections and heart disease have been linked to periodontal bacteria. Scaling and root planning remove bacteria and halts periodontal disease from progressing, thus preventing the bacteria from traveling to other parts of the body. Tooth protection – When gum pockets exceed 3mm in depth, there is a greater risk of periodontal disease. As pockets deepen, they tend to house more colonies of dangerous bacteria. Eventually, a chronic inflammatory response by the body begins to destroy gingival and bone tissue which may lead to tooth loss. Periodontal disease is the number one cause of tooth loss in the developed world. Aesthetic effects – Scaling and root planning helps remove tartar and plaque from the teeth and below the gumline. As an added bonus, if superficial stains are present on the teeth, they will be removed in the process of the scaling and root planning procedure. WHAT IS THE PROCESS OF SCALING & ROOT PLANING? Depending on the current condition of the gums, the amount of calculus (tartar) present, the depth of the pockets and the progression of the periodontitis, a local anesthetic may be used. Scaling is performed with special dental instruments and may include an ultrasonic scaling tool. The scaling tool removes calculus and plaque from the surface of the crown and root surfaces. In many cases, the scaling tool includes an irrigation process that can also be used to deliver an antimicrobial agent below the gums that can help reduce oral bacteria. 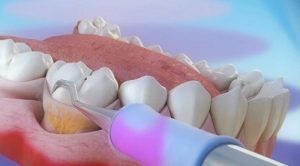 Root Planing is a specific treatment to remove cementum and surface dentin that is embedded with unwanted microorganisms, toxins, and tartar. The root of the tooth is literally smoothed in order to promote good healing. Having clean, smooth root surfaces helps bacteria from easily colonizing in the future. Following each of these deep cleaning procedures, the gum pockets may be treated with antibiotics. This will soothe irritation and help the gum tissues to heal quickly. During the next appointment, your dentist or hygienist will thoroughly examine the gums again to see how well the pockets have healed. If the gum pockets still measure more than 3mm in depth, additional and more intensive treatments may be recommended. GET STARTED ON HEALTHY GUMS TODAY! Glendale Heights Family Dental offers free consultations to thoroughly discuss your options with you, and help you weigh the pros and cons. Learn more about how you can benefit from any one of the dental implant solutions. Call Glendale Heights Family Dental at (630) 866 – 6000 to schedule an appointment today! The Glendale Heights Family Dental staff is friendly, professional, and helpful, with state of the art amenities, and technically advanced examination rooms. Once seated, everything is done right there. I would highly recommend them! Dental Emergencies can happen at any time. Often, you cannot ignore the pain. Call our office for help. At Glendale Heights Family Dental we treat emergencies promptly. Call For Appointment and Emergencies! Glendale Heights Family Dentistry provides comprehensive general and cosmetic dental services to patients of all ages. Our friendly and experienced staff will help you with all of your dental needs. We are proud to be the family dentist of choice for patients across Glendale Heights. Dental Emergencies can happen at any time. Often, you cannot ignore the pain. Call our office for help. We treat emergencies promptly.